Hometown: West Long Branch NJ/Rehobeth, Mass. 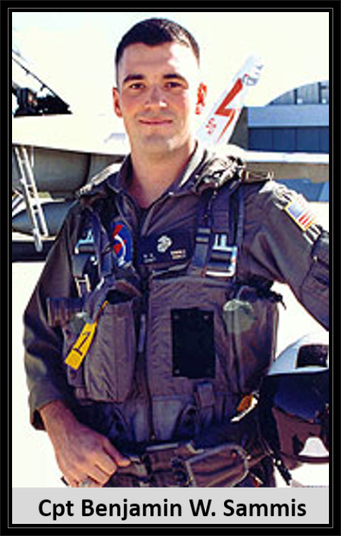 Died: April 4, 2003 in Operation Iraqi Freedom. Unit: Marine Light Attack Helicopter Squadron 267, Marine Aircraft Group 39, 3rd Marine Aircraft Wing, Camp Pendleton; Calif.
EATONTOWN — With a Marine color guard, the playing of "The Star-Spangled Banner" by the student band, and a handful of speeches, a young dogwood tree and monument were dedicated at Woodmere School to all those who have died in "the battle for Iraqi freedom." The ceremony, held Monday under the first sun to shine on the Shore in some time, was aimed at all who made "the ultimate sacrifice," but most of the speakers focused on two servicemen with ties to the Eatontown school district who were killed in Iraq. They are Marine Capt. 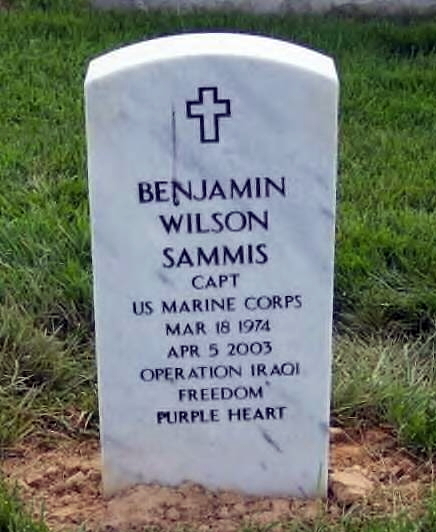 Benjamin W. Sammis, 29, a pilot, who was killed with another pilot April 5 in a helicopter crash during a combat mission 30 miles southeast of Baghdad, and Army Spc. Kyle Griffin, 20, who died May 30 in a truck accident on a highway in Iraq. Sammis was the husband of Stacey Sammis, whose mother, Joyce Dancisin, is a third-grade teacher at the Woodmere School. Griffin was the nephew of Rosemarie Boratto, a secretary at the Memorial School. CHRIS KELLY Stacey Sammis speaks at a ceremony at the Woodmere Elementary School, Eatontown, honoring those who lost their lives in Operation Iraqi Freedom.Stacey Sammis and her husband lived in Vista, Calif. She is returning to the Shore now and attended the dedication with her mother and father, Michael Dancisin, longtime West Long Branch residents who now live in Avon, and her sister, Amy. Joseph Miller, exalted ruler of Eatontown Elks Lodge 2402, which arranged the memorial, said before the ceremony that the lodge has a lot of former military men in it and wanted to do something in memory of all who have died in Iraq. To those gathered on the lawn by the tree for the formalities, including all the third-graders, he said, "We’re here today to honor all those in the military who made the ultimate sacrifice while protecting us at home." Barbara Struble, principal of the Woodmere School, said she had met Sammis and he truly was a model for the youth of today to emulate. "He had so much to give to the country and he did — he gave it all," she said. Struble said she never met Griffin but observed that he wasn’t even 21 when he died. "I know they’re with us today," she added. "To Ben and Kyle, we owe you our great appreciation," she said. "You gave us liberty, which is so dear to our hearts." Robert J. Soprano, superintendent of the Eatontown schools, said it was a sad day because whenever someone is lost on the battlefield, it makes not only the family but also the whole country sad. However, it also was a proud day for the families, he said. Soprano recalled how Winston Churchill had said courage was the most important virtue. Without it, he said, none of the other virtues would follow. Marine Lt. Col. James Sole, of Red Bank, said that both Sammis and Griffin died doing what they loved and that establishing the memorial sends the clear signal that those present shared their love of this country. "Patriotism is not the fear of something. It’s the love of something," he said. Mayor Gerald J. Tarantolo recalled how more than 600,000 men and women had given their lives in the service of their country over the years. He said planting the tree serves as a lasting reminder of Sammis and Griffin and is a way to try to say thank you to them and provide solace for their families. "The cost of freedom comes with a high price tag," he said. "It is not free." Stacey Sammis, Joyce Dancisin and Boratto joined with the officials in lifting the cover from the monument laid in the ground in front of the tree, which reads: "In memory of those who made the ultimate sacrifice during the battle for Iraqi freedom. Dedicated June 2003. Eatontown Elks #2402." Stacey Sammis, a graduate of Shore Regional High School, then thanked everyone for what they have done for her family and, with her voice breaking, read a note that her 8-year-old neighbor whom her husband had befriended had written about him. "Whenever I saw him, he was smiling," the note said in part. "My favorite memory was when he showed me his night vision goggles." Putting down the note, she said, "He touched the lives of so many — even the young." Capt. Sammis was killed when his helicopter crashed into a tower, according to Darlene Miller, who helped the Elks in arranging the dedication. She said it was not known yet whether the crash was caused by equipment failure or by enemy fire. No further information was available on the truck accident in which Griffin died. Classmates along with the parents of Marine Capt. 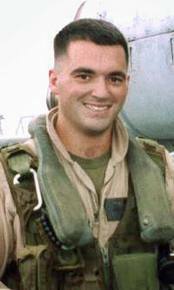 Benjamin Sammis paid tribute Thursday to the 1996 Citadel graduate who was killed in action in Iraq. 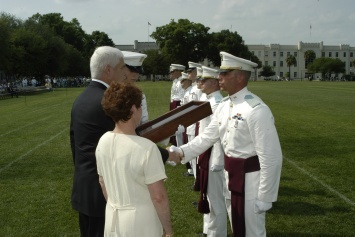 Steve and Beth Sammis presented the "Captain Benjamin W. Sammis Class of ’96 Semper Fidelis Sword" to Cadet Robert C. Fiorille. 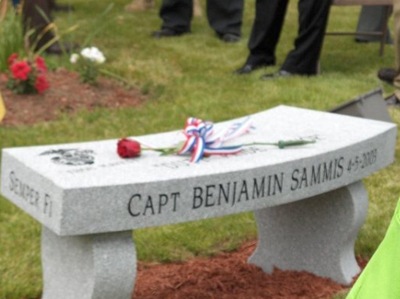 20 April 2003:The life of Captain Benjamin W. Sammis was celebrated and his death mourned yesterday at a memorial service in Newman Congregational Church. Captain Sammis, a 29-year-old Marine from Rehoboth who was killed in Iraq earlier this month, was buried last week in Arlington National Cemetery, with full military honors. Hundreds of people packed the church, which set up additional seating and a video link to broadcast the service in another room to accommodate the crowd. The overwhelming loss felt at Sammis's death was palpable in the church, where mourners heard tales of his life and spirit from friends, family and fellow Marines. Muffled sobs could be heard from the crowd, even as a 21-gun salute was fired and taps was played in the sunshine outside. Steven B. Sammis, the soldier's father, told the assembly from the pulpit that many others shared the pain he felt. "This sorrow hits with a devastating thrust in the core of my soul," Sammis said. 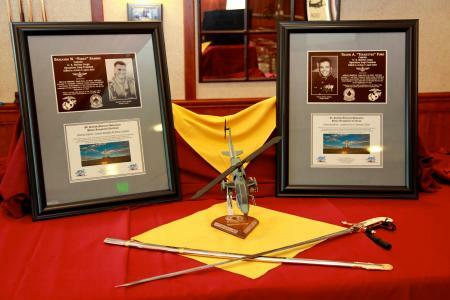 Captain Sammis -- who was killed along with his copilot when his helicopter crashed around April 5 -- had wanted to fly ever since he was a child. "Many years ago, a small boy was overwhelmed with a dream to become a pilot," his father said yesterday. Captain Sammis had been in combat for 16 days when the Cobra helicopter he was piloting crashed southeast of Baghdad, said Capt. Aaron Marx, a friend and fellow Marine, in the eulogy. 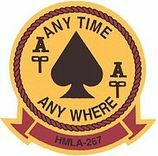 They were operating in a "dangerous environment," he said, in which the attack helicopter they were in had been exposed to enemy ground fire. 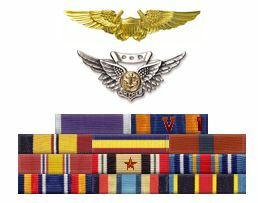 The two pilots responded to that fire, Marx said, adding that he believed "there are Marines alive today" because of their actions. Some of the people assembled in the church yesterday told stories of Ben Sammis, the sailor, husband, son and brother. One man brought a message from a friend and minister to Captain Sammis's wife's family. The message read that Captain Sammis was "every mother's answered prayer that a good, decent man would love her child." Someone else remembered how Ben, as a sailing instructor at the Barrington Yacht Club, helped a young boy, whose boat had capsized, get out of the water, then coaxed the terrified child back the next day and taught him how to sail. "In a world where decision makers live in the gray, Ben knew right from wrong," the soldier told mourners. "This country lost a great man."